The Winter family originally came to Ireland under curious conditions. According to Burke’s Genealogical and Heraldic History of the Commoners of Great Britain and Ireland (1835), Dr Samuel Winter, an Anglican clergyman originally from Warwick had during the English Civil War settled in a parish in northern England. However, ‘In 1650 Dr Winter was obliged to resign the living of Cottingham, York, of which he was Rector, being ordered by the then Government to proceed to Ireland with the Commissioners appointed for the settlement of that country, as their Chaplain, and was soon after (on 3rd June 1652) constituted Provost of Trinity College, Dublin, which the preceding troubles had left almost dissolute. In this office he exerted himself with great zeal and success to reassemble the surviving members, and to re-establish the discipline of the University. He appears to have been removed from the provostship at the Restoration.’ Dr Winter then returned to England but not before confirming himself in the ownership of lands in Counties Offaly, Meath and Westmeath. On his death these were duly inherited by his eldest son, another Samuel, who had married a sister of the anabaptist Cromwellian solder, Colonel Zierom Sankey. Subsequent generations made equally good marriages, the most significant of which was the union c.1738 of Francis Winter (who had already inherited the estate of his childless elder brother) and Margaret Pratt, daughter and heiress of Benjamin Pratt of Agher, County Meath: like the Winters, the Pratts originally came to Ireland as part of the Cromwellian settlement and had bought Agher from Henry Jones, Bishop of Meath. In 1771 the son of Francis and Margaret Winter, yet another Samuel Winter, was left Agher on the death of his Pratt grandfather. Soon after he built a new house on the land, moving into it in 1776. However, the cost of the property, of three storeys over basement, together with other financial setbacks, obliged Samuel first to mortgage and then to sell some of his other lands. Thereafter the family seem always to have been short of funds: in 1817 Samuel’s son John Pratt Winter was forced to lease Agher, auction his stock and furniture, and take his wife and younger members of the family to live in a boarding house in Paris where they remained for seven years. The last of the Winters to live at Agher was Captain Charles Edward Purdon-Winter who in 1936 sold the estate to the Irish Land Commission. The land was split into diverse lots and in 1947 the house demolished by controlled explosion, its rubble used to fill the basement. Today little remains to recall the Winters of Agher other than the church and its surrounding graveyard, both of which they did so much to beautify. The church was erected by the family in 1804 on the site of an older building (Jonathan Swift held the living from 1699 until his death in 1745). It was further extensively refurbished by the Winters in 1902 and at that date a four-stage buttressed tower and porch was added at the west end. Internally the church’s most distinguished feature is the window above the altar table. After Raphael and representing St Paul preaching to the Athenians, this was originally made for the private chapel of nearby Dangan Castle, seat of the Wellesleys (forebears of the Duke of Wellington) until abandoned by them at the end of the 18th century. The artist responsible was Dublin-born Thomas Jervais, who according to Strickland, ‘For the Duke of Leinster he executed some stained glass, which was formerly in the bow-window in the large room in Leinster House; and did several windows for Lord Charlemont at Marino, which were destroyed by fire in March, 1807. Three windows by him were formerly in Rathfarnham Castle, as recorded by Austin Cooper in 1781; but they have now disappeared.’ Around 1770 Jervais moved to London where he remained for the rest of his life. Thus the Agher window now appears to be the sole surviving example of his workmanship in this country and is particularly important because it is not stained but painted, using a technique he devised for himself. Less rare but equally charming is the Winter mausoleum found in the graveyard, its first occupant of its barrel-vaulted interior being Samuel who died in 1811. A late flourish of the Gothick style, the façade has a three-bay battlemented façade, the breakfront centre capped with pinnacles as are the outer miniature turrets. The arched opening is flanked by similar windows with a recessed quatrefoil above each. It stands a memorial to past Winters and, with little else remaining to do so, serves as a recollection of their long presence in this part of the country. The Irish Georgian Society is currently fund-raising to help with the cost of restoring the Jervais window in Agher Church. The work comprises a series of painted panels which were then fitted between thin lead bars to make the picture. In its present position (see above), it contains an error of assembly: can anyone spot what that is? Wonderfully sited above the Blackwater river, Salterbridge, County Waterford has a complex building history. The core of the house, the three bays articulated by the giant limestone Tuscan pilasters and heavy parapet entablature, likely date from c.1751 when a residence was constructed here by Richard Musgrave who had acquired this portion of lands previously owned by the Earls of Cork. In the early 19th century his grandson Anthony Chearnley, who had married an heiress, embarked on a programme of enlargement and embellishment, extending the house’s by a further bay on either side and giving it the Wyatt windows seen on the first floor. Further work took place in the 1840s when the ground floor canted bays were added and the glazing here altered. Born in 1786 at Elm Hall, County Tipperary, John Burke moved to London where he became engaged in genealogical studies. In 1826 he issued his Genealogical and Heraldic Dictionary of the Peerage and Baronetage of the United Kingdom the first such work in which entries were arranged alphabetically, and both peers and baronets were included. Initially continued by his descendants before passing into other hands, the abiding popularity of ‘Burke’s Peerage’ has led to its regular appearance ever since. In 1819 Burke met another displaced Irishman, the artist Adam Buck who that year exhibited a watercolour portrait of his new friend’s wife at the Royal Academy. Further images of the family followed (some seen below) not least the picture above: dating from 1833 it depicts John Burke and his son, the future Sir John Bernard Burke. These works are included in an exhibition devoted to Buck currently running at the Crawford Gallery, Cork (the artist’s native city). As one of the most prolific and successful miniaturists and portraitists of the early 19th century, Buck saw his work widely reproduced as prints or on porcelain. However even before his death in 1833 (the same year as the Burke double-portrait) he had begun to fall out of fashion and for a long time thereafter was little regarded. This exhibition helps to re-establish him as one of Ireland’s finest artists of the period and merits a visit to Cork. 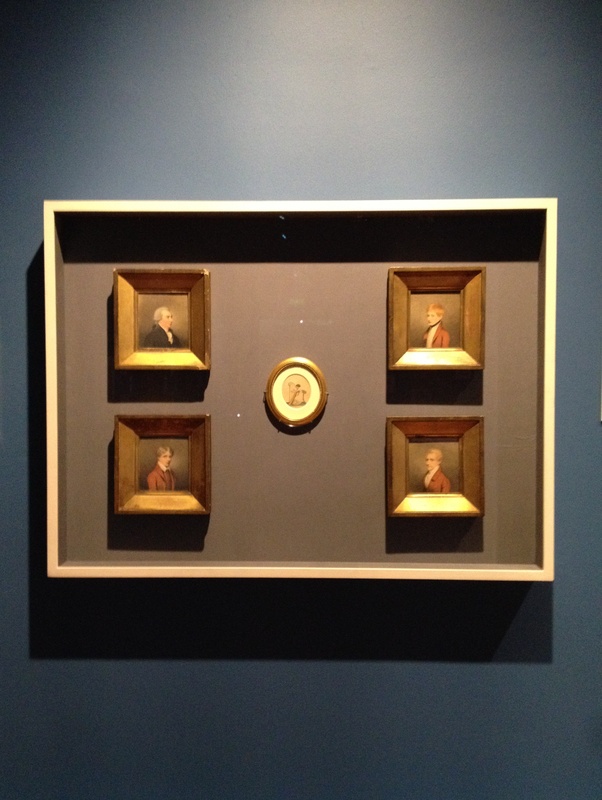 Adam Buck (1759-1833): A Regency Artist from Cork runs at the Crawford Gallery until April 9th next. Few houses better exemplify the maxim of initial appearances being deceptive than Headfort, County Meath. An immense, austere block – the limestone facade including wings runs to more than five hundred feet – in 1789 it was described by then-Lord Lieutenant the Duke of Rutland as ‘a long range of tasteless building’ and three years later George Hardinge said it was ‘more like a college or an infirmary’ than a private residence. Headfort was built for the descendants of Thomas Taylor who came to Ireland in the middle of the 17th century in the company of his school contemporary Sir William Petty. By 1660 Taylor had secured 21,000 acres of land in Cavan and Meath, and settled outside Kells. No trace remains of the original house constructed by the family, but from the middle of the 18th century onwards plans were under way to build a new country seat suitable for their advancement in the Irish peerage: already a baronet, the third Sir Thomas Taylor, who inherited the estate in 1757, would be created Baron Headfort in 1760, Viscount Headfort two years later and Earl of Bective in 1766. His son, in turn, would become first Marquess of Headfort in 1800. The first architect consulted about designs for a new house was Richard Castle, a favourite for such commissions among Irish landowners during the period. However in this instance his proposals of 1750 failed to win the approval of the second Taylor baronet; an extant portfolio is marked: ‘Mr Castle’s plan and a damn bad one.’ John Ensor and another anonymous architect also drew up proposals for a similarly Palladian-style building but these too were spurned. The Taylors were not as wealthy as some of their contemporaries and funds to spend on the building were limited. Presumably this is why although still more designs were commissioned in 1765 from fashionable neo-classical architect William Chambers those were similarly rejected. In any case, by that date work had already started on a sober, and accordingly economical scheme which, on the basis of a 1760 plan inscribed GS, is attributed to George Semple, a Dublin-based builder and self-taught architect. Whoever was responsible, the house’s exterior would not have required much architectural skill in its composition. Of three storeys and 11 bays, the near-identical front and rear elevations of grey Ardbraccan limestone are largely unrelieved other than by pedimented doorcases. But if the house’s exterior lacks ornament, its interior was intended to present a different image. Between 1771 and 1775, Lord Bective requested Scottish-born architect Robert Adam to produce decorative schemes for a suite of rooms in the newly completed Headfort. Adam, who never visited this country, duly came up with designs for the entrance and staircase halls, as well for as a series of three adjacent spaces on the garden front culminating in a double-height saloon that was known as the ‘Eating Parlor.’ Even if not all his proposals were fully implemented, the interiors are of immense importance as the only extant examples of Adam’s work in Ireland. Once more due to shortage of funds, a simplified version of the suggested decoration was executed in the entrance and staircase halls. But the architect’s original drawings survive and indicate that other elements of the scheme were carried through, not least in the Eating Parlor, where the only major modification saw the architect’s recommended barrel-vaulted ceiling instead being coved. Created by reconfiguring the house’s layout to merge two rooms on both ground and first floors, the Eating Parlor is lit by a line of tall windows between which stand the original marble-topped console tables and pier glasses. Facing these are a pair of carved white marble chimneypieces with circular overmantles holding classical compositions by the Italian artist Antonio Zucchi, who worked with Adam on a number of other occasions; further Zucchi work is found elsewhere in the room, including a ceiling centrepiece. The rest of the walls are covered with panels intended to contain Taylour family portraits, and a number of matching doorcases. The adjacent, somewhat smaller, saloon is similarly decorated but the third room in the suite, the Chinese Drawing Room, has since lost the landscape wallpaper from which derived its name. Inevitably with the passage of time, the fabric of Headfort began to deteriorate; problems of damp coming into the building were a particular problem. It didn’t help that since 1949 the house has served as a preparatory school, with inevitable wear and tear on its fabric. Due to the significance of the Adam interiors, in 2004 the World Monuments Fund placed the house on its list of 100 Most Endangered Sites. Thereafter the Headfort Trust, thanks to funding from the WMF, Ireland’s Heritage Council and relevant state departments, initiated a programme of essential work including repairs to the roof, chimney stacks and gutter piping. Internally the trust embarked on a conservation and research project that revealed the original Adam decorative scheme. Nowhere was this more the case than in the Eating Parlor which underwent complete refurbishment thanks to aid from the Irish Georgian Society which in 2008 made the room the beneficiary of its 50th anniversary fundraising efforts. For a long time the Eating Parlor had been painted a shade of blue more usually found in hospital wards. However analysis of the walls revealed they had first been decorated using a variety of mid- to dark shades of verdigris, a scheme which tallied with the Adam drawings. The same colours were also used in the staircase hall, while those of the Saloon are softer, with an abundance there of pink and pale blue. When initially finished, and furnished, the effect must have been quite startling and highly novel, and even today, depleted of their contents and put to alternative use, these rooms can still confound the popular notion of how a chaste neo-classical interior should look. Today, when no other examples of Adam’s work can be seen on this island, it is a unique legacy. On a hillock rising above Lough Bane, County Westmeath stands this small circular building. When was it originally constructed, and for what purpose? Clearly the upper section has been lost but the space inside is still roofed. A series of windows, some large others more like rifle holes, run around the walls, and there are a couple of large openings to permit access, which invalidates the idea that it might have been intended for defensive purposes. The interior also contains the remains of a fireplace. The views from this spot are spectacular, and allow 360 degree panoramas for many miles, so it may have served as a lookout point. Any ideas? Two County Kildare mid-18th century houses, located less than four miles apart and linked by marriage not long after both were constructed. It is therefore no wonder that they share certain characteristics, not least in the matter of decoration. The elaborate cornice above is found in the drawing room of one house, that below in the dining room of the other. But they clearly come from the same hand and show the inspiration, if not necessarily the involvement, of Robert West who was producing work of this kind during the 1750s/60s. Photographs are of an abandoned farmhouse in County Westmeath. The ferociously-protected entrance of Freame Mount, County Monaghan. This charming red-brick house dates from 1772 when built by Charles Mayne, agent for the nearby Dawson estate at Dartrey: its name derives from Philadelphia Freame, granddaughter of William Penn and second wife of Thomas Dawson, first Lord Dartrey. A flight of steps leads to the cut limestone tripartite door, the latter’s proportions somewhat too short so that more space than is customary has been given to the gothick fanlight. George Petrie (1790-1866) is today best recalled as one of the 19th century’s most notable antiquaries and archaeologists but he was also a fine artist, who n 1857 became President of the Royal Hibernian Academy. Many of his pictures provided the basis for engravings used to illustrate the period’s guidebooks and travelogues, and while he drew and painted views of the country’s ancient monuments he also produced a series of watercolours showing the Dublin of his day. To mark the 150th anniversary of Petrie’s death, the Royal Irish Academy (here he served as Vice President and which holds much of his archive) is currently exhibiting some of these pictures such as the view of Christ Church Cathedral above, which shows the building prior to its comprehensive restoration in the 1870s. Similarly the image below captures City Hall in its original incarnation as the Royal Exchange, and with a row of buildings to the immediate east which have long since been demolished. A fascinating show and well worth visiting in its final days. Views of Dublin: Original Watercolours by George Petrie, MRIA runs at the Royal Irish Academy, 19 Dawson Street, Dublin until next Monday, February 15th. Pictures reproduced by permission of the Royal Irish Academy © RIA. Internally, Hilton Park looks much as it did when Madden and Hague had finished their work on the building around 1878. The front door gives access to a hall with encaustic tiles and barrel vaulted ceiling: on either side a former coachman’s and housekeeper’s room became a study and smoking room respectively. Double doors open to the stair hall in carved oak which climbs to the first floor reception rooms (the oak was worked by John Armstrong, estate carpenter at Parkanaur, County Tyrone, seat of John Madden’s kin the Burges family, who was loaned for the purpose). On the upper section of the west wall are a pair of heraldic stained glass windows made by Mayer & Co of London: between them is a niche holding a bust of ‘Premium’ Madden. At the top of the stairs a door to the immediate left opens into what had been a vast double drawing room: for reasons of practicality (and heat conservation) this was divided in two in the last century when the central timber archway was filled in. The northern section has a heavily carved Victorian chimney piece, the southern contains that brought back from Naples by the earlier John Madden. A boudoir to the north completes this run of reception rooms, ample enough to host a ball. Meanwhile at the centre of the south side of the house is the dining room which did not undergo refurbishment in the 1870s and therefore remains as designed by Jones forty years earlier; vaguely gothic in intent, it has sprung vaulting featuring oaks and ropes initiated from foliate corbels in each corner, but a classical black marble chimney piece (the rope motif was said to be in honour of Horatio Nelson with whom Colonel John Madden’s father-in-law Admiral William Wolseley was friendly and had sailed). Also still retaining their original décor are the bedrooms above, the walls of one still covered in a pretty blue floral paper hung in the 1830s. Although much has changed in the intervening period, Hilton Park still remains in the hands of the Madden, the ninth generation now responsible for its future. Open to the public for weddings, weekend guests and houseparties (see hiltonpark.ie) it wonderfully exudes much of its original atmosphere, although one suspects that were earlier occupants to return they would be amazed by how much warmer and more comfortable is the house than used to be the case (and how much better the cooking today than it traditionally was in such places). All being well, the Maddens will continue to reside there offering Hilton hospitality for at least another nine generations. *Of course if anyone knows of such a thesis, please let me know.